I may be easily amused but I also demand a certain level of service at a high end steak restaurant. That is why I take great delight when the crumb sweeper appears. 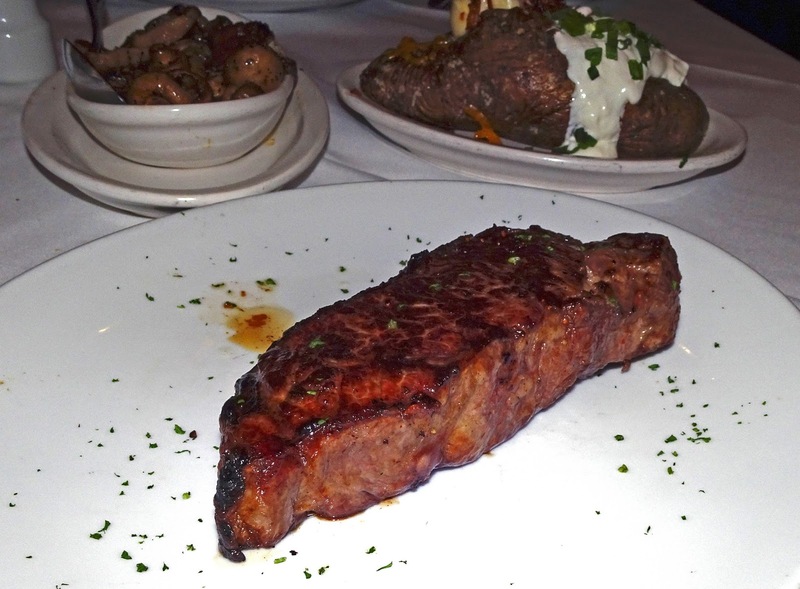 Last night we dined at Flemings in Walnut Creek I had the most decadent Dry Aged Prime 16 ounce New York Strip steak. 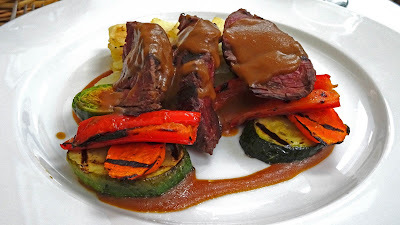 This steak was corn-fed bliss. It was the end of our meal and I took a small piece of bread and strategically placed some crumbs on our table. It was time to see if the crumb sweeper would appear. The busboy sort of saw me as he was filling my water glass. He was oblivious and placed the water on top of my wayward bait crumbs. Our cheerful waitress came to the rescue and deftly dispatched the crumbs with her custom crumb sweeping comb. I was happy. Maybe I am easily amused. The Saturday Farmers Market in Santa Rosa is my kind of farmers market. There were three different vendors selling meat. 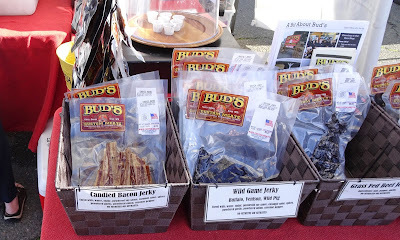 I purchased from 2 of these meat purveyors and wanted to share the candied bacon jerky from Bud's meats. 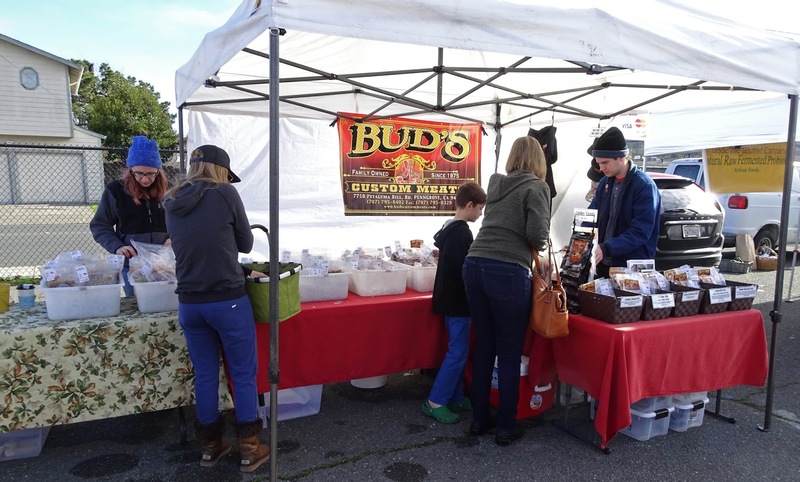 We are no strangers to Bud's and have visited their butcher shop numerous times. This is the first time I have seen them at the farmers market. Looking at all their meaty delights the candied bacon jerky called out my name. Of course I had to oblige. I almost did not make it home before trying this candied cured swine. It was and is a sticky chewy beautiful mess of bacon love. This has a chew that will not quit. 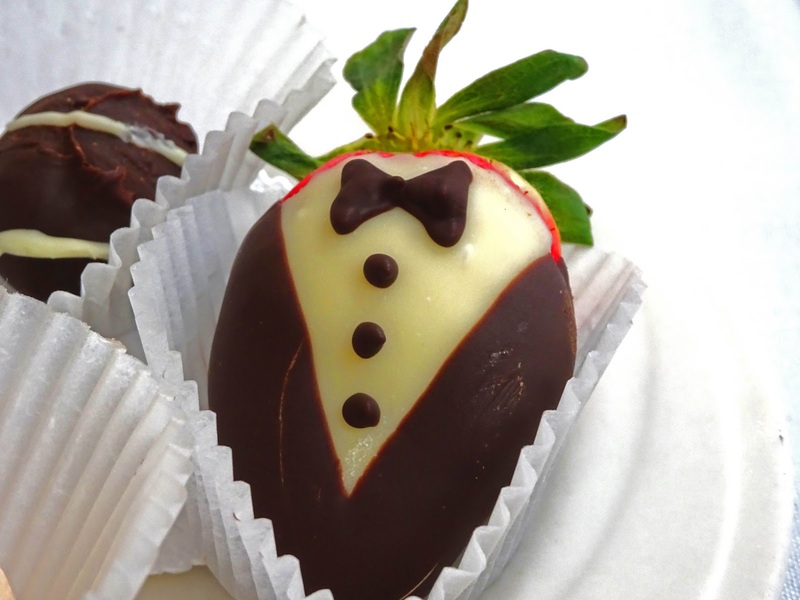 Be prepared to have a gaggle of napkins because this is sticky with sugary delights. The bacon has the right amount of smoke, salt and pork flavor. Bud's knows the all important balance equation. I just ate this straight out of the package and do not think it will make it into any prepared dishes. 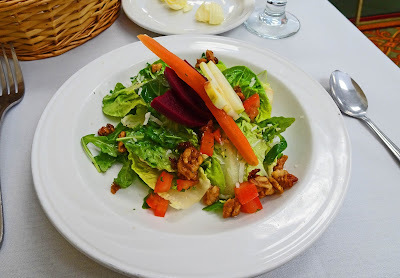 I am sure it would be great cut up on salads or used as a topping for all sorts of dishes. I am not sure if I have ever told you, but, I love bacon. This product is a winner. If you ever stop by the Santa Rosa Farmers market be sure to pick up a package of Bud's candied bacon jerky. 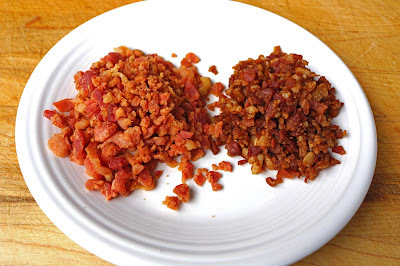 Our friend and fellow blogger BigDude posted a recipe that included real bacon bits. Maybe it is because I do not do a lot of shopping but I never knew about this product. My experience with bacon bits was the crunchy fake products I enjoyed as a youth. These products are the real deal made with real bacon. I ventured to the local Wally=World and found both of these products side by side on the shelf. One was made by Oscar Meyer and calls itself Real Bacon Bits. 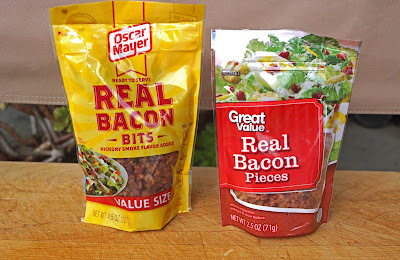 The other is Real Bacon Pieces which was made by a house Wally World brand. The Wally-World brand was slightly cheaper but they both were inexpensive so I bought both. Let’s do a taste test. I read both ingredient lists and they both were very similar. In fact they were so close it leads me to believe the house brand was made by Oscar Meyer too. After a visual and taste inspection they are using different recipes if it is the same manufacture. We just sampled this right out of the box. Both tasted like bacon; Surprise, Surprise. They both had texture issues meaning they were not crisp and the Wally house brand was a little chewy. 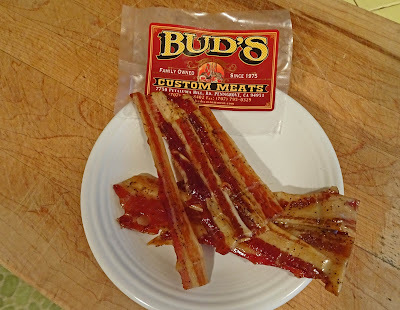 The flavors were both of beautiful bacon and I actually liked both products very much. I would use this product on salads, egg sandwiches, omelets, baked potatoes and possibly on ice cream. The Oscar Meyer brand may have been a slight more salty but this was not an issue. I declare a tie in the Real Bacon v Real Bacon. Maybe a texture difference and a slight variance of salt but both products were equally good. They will never replace real bacon cooked by you but these are an inexpensive alternative. Did I mention they are gluten free? Will wonders never cease? The Football playoffs were on the television and once again the Bay Area was not represented. I just cannot get too excited about football when two teams are battling that I have no particular interest in. What I am interested in is the dinner that awaits us tonight. We are expecting corn-fed bliss tonight. We make no apologies for not embracing the grass fed beef passing fancy. We eat what we love. 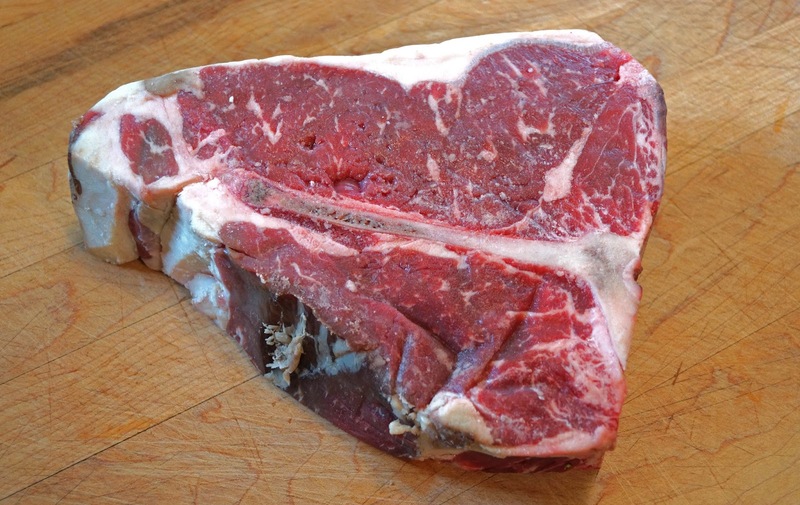 We love 3.25/pd dry aged USDA Choice Porterhouse cut beef from Willowside Market in Santa Rosa. It is the perfect time to break out my Christmas present; "Original Kettle Premium Limited Edition Weber. It is time for kick-off. This hunk of beautiful hunk of protein brings joy to my heart. It is so perfect. The Porterhouse has a New York strip steak for me and a tender filet for Ms. Goofy. We actually share both sides of this steak but truth be told Ms. Goofy has a healthy piece of the fillet and I ravish the rest. You can even see me knawing on the bone. Our 75 pound lap dog Lucy gives me a dirty doggy look when knawing activities occur. 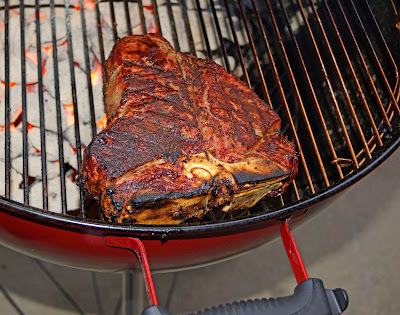 The new Weber makes quick work of this beautiful steak. A combination of direct and indirect cooking brings this steak to a perfect medium rare. One feature of our new Weber is this thermometer. I did have a very hot fire and the thermometer attests to that. I wonder of the accuracy and will do some further testing later. Ms. Goofy made dessert of a chocolaty sprinkle topped cake. It does not get any better than this. We have two weeks to prepare for the Super Bowl. I do not care at all who wins. (That is not entirely true. Everybody wants to see the Patriots lose.) What I do care is what we prepare for the Super Bowl Party. I can guarantee it will be tasty. We are trying a couple of products from Micky V’s hot sauce company. I received a basket of goodies this Christmas from my Secret Santa and it was full of Mick V’s products. 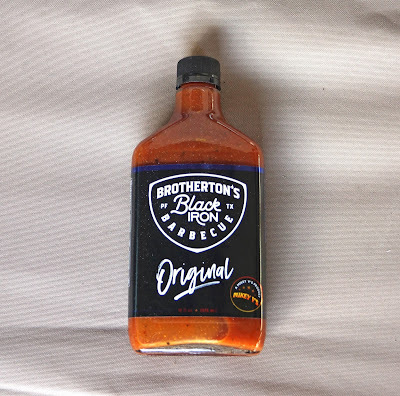 We will be sampling a rub called “Brok Da Mout and a barbeque sauce called Brotherton’s Black Iron Barbeque sauce. 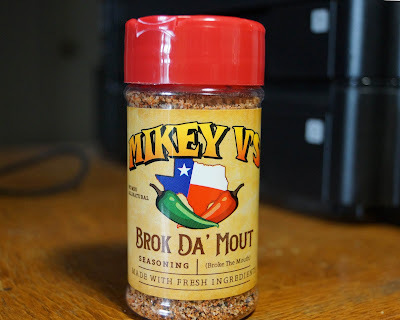 Micky V’s website does not have a lot of information on these products except they are made in Texas. We will look at the ingredient list and give it an old fashion taste test. Micky V’s does offer this about Brok Da Mount. 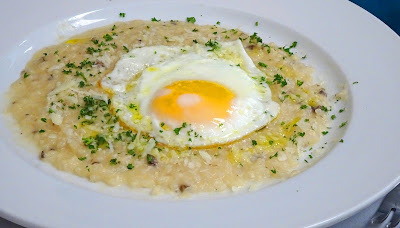 Hawaiian definition: (Brok Da Mout) used when describing food that is unbelievably delicious. We will start with the rub ingredients which will be very easy. Salt Pepper (black and red) garlic and Carolina Reaper Peppers are the listed ingredients. 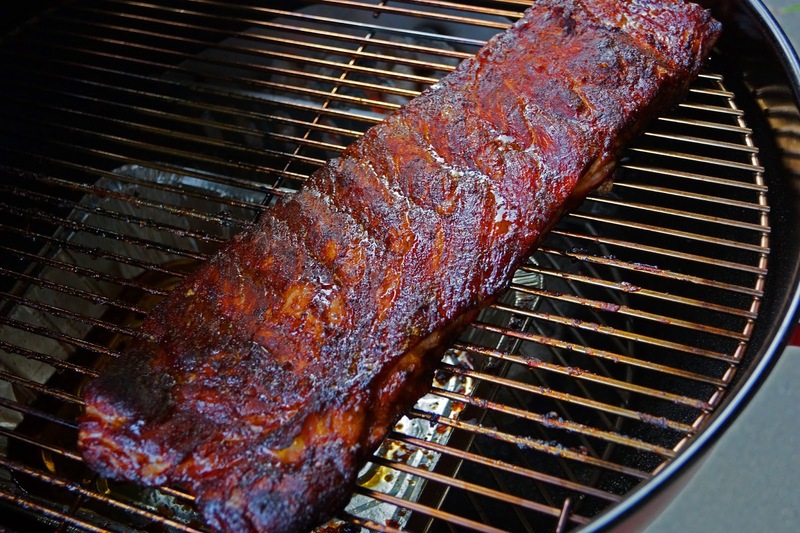 Now Carolina Reaper Peppers are some of the hottest around but this rub uses them in restraint. An initial taste test reveals salt and pepper with the slightest hint of Reaper Pepper. It only registers a slight tick over the mild notch on the heat meter. Brothertons Black Iron sauce has the usual suspect on their ingredient list. This is a tomato base sauce that has natural smoke flavoring in the mix. It is a fluid sauce that pours easily from the bottle. It smells very pleasant. It makes me hungry for the bbq to come. 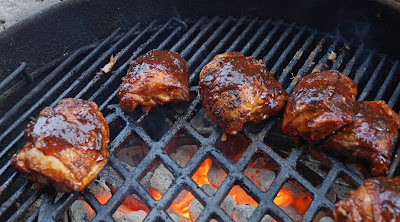 Chicken thighs are dusted with the rub. We cook the thighs using direct and indirect heat. We put some sauce on the last 4 minutes to experience the flavor to the utmost. Drumroll Please: We had a very nice meal. Ms. Goofy said the rub was very good and she could taste the peppers with just the right amount of seasoning. I on the other hand could not taste the peppers and thought the rub to be on the salty side. The sauce was very good but not spectacular. It was your run of the mill bbq sauce. I hate to say it was nothing to get excited about. Well in conclusion Micky V’s puts out some nice but not great rubs and bbq sauce. In my opnion. Rodeo, California has seen better days. The highway brought many travelers through town to support numerous bars, restaurants and business. A freeway bypass was built in the name of progress. This was one of the factors that has dimmed the lights in our small town. The bars are gone and have been replaced by churches. The old movie theater has been taken over by the "Inglesia La Luz Del Mundo" church. 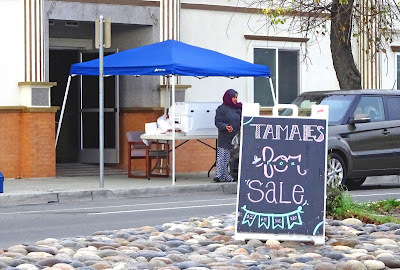 To raise funds for their church they sell tamales on Saturdays in front of their venue. This women pictured above braves the elements and sings her tamale song. We see her all the time while walking our dog and decided it was time to give these tamales a try. 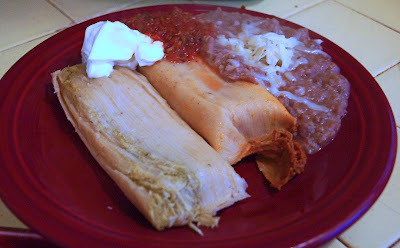 The tamales come in several different flavors. We bought beef in a red sauce and chicken in a green sauce. They cost two dollars a piece which includes little containers of salsa. They are sold warm and ready to eat. Some home made re-fried beans were made; which I might add were fortified with some bacon love. (grease) These tamales were the bomb. The fresh masa that encompasses the filling is a warm comforting flavor and texture. There is a prevalent corn flavor that is seasoned and reinforced with lard. The fillings were mild with hints of mild chili additions. These tamales are the real deal. 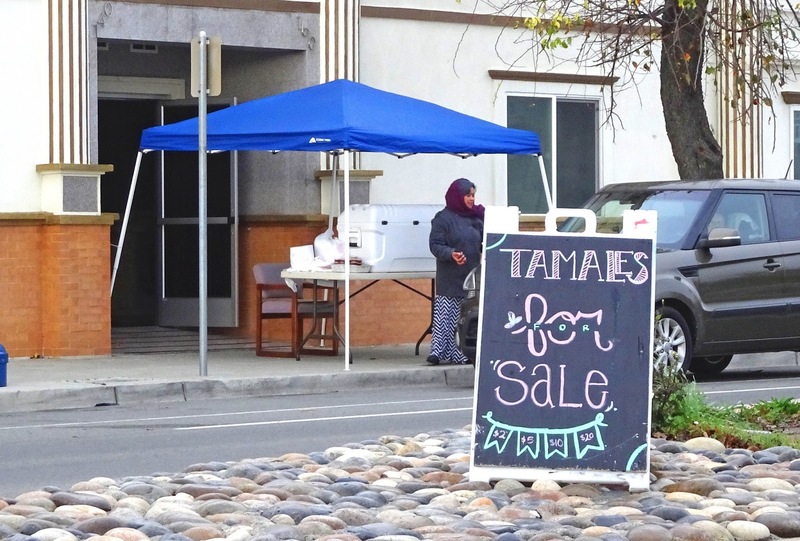 Rodeo may be an evolving town but at least we have tamales. The Treasure Island Job Corps Fine Dining is such a special culinary treat that I was hesitant to share this meal with you.. 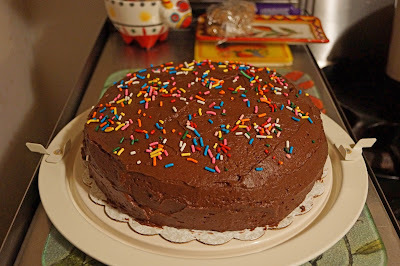 I did not want to share for selfish reasons. 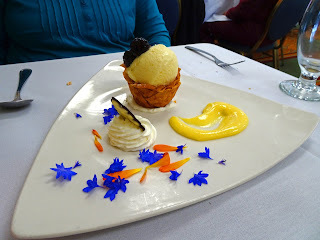 For the small fee of 13 dollars one can dine on a three course gourmet meal prepared by students of the various culinary classes of the Treasure Island Job Corps. This will be our third visit and against better judgement we would like to share this experience. (Just keep it a secret please). 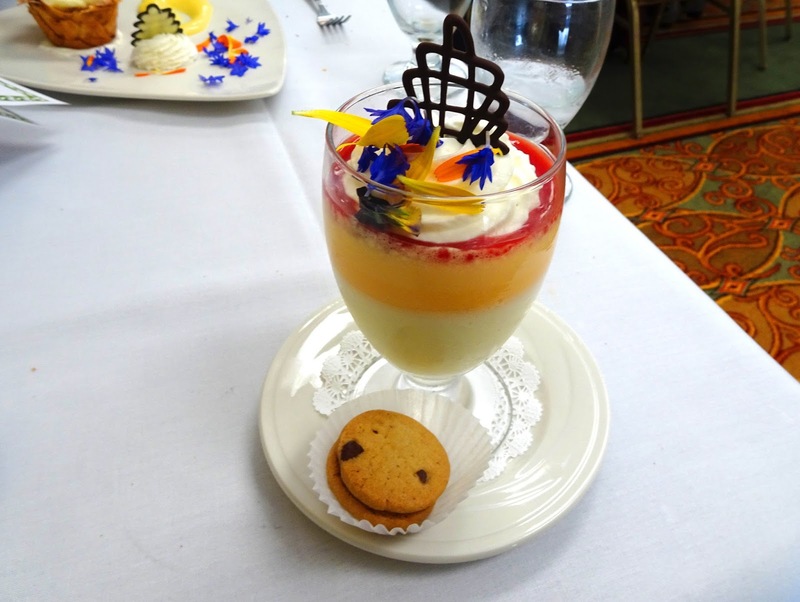 Flaky pastry cup encasing Diplomat custard crème, topped with glazed fresh fruits, berries, and garnish. The meal is served with several beverage choices (no alcohol) which included the usual suspects and the most flavorful fruit smoothies. Before the dessert course a plate of candies that included the tuxedo chocolate covered strawberry above was fantastic. You can see now why I was hesitant in sharing. Oh my this meal was fantastic. 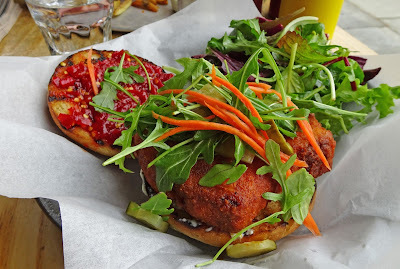 We are starting our New Year with lunch at Clove & Hoof in Oakland California. This restaurant slash butcher shop serves quality meals with some fancy modern pedigree meat. We are no strangers to this butcher shop and wanted to take advantage of the break in Bay Area traffic because of the Holidays. Parking karma was in full force today possibly because the Great White Hunter was not here to jinx our luck. We parked right smack in front. My fried porkchop had Piment d'Espelette jam, arugula, bleu cheese mayo, and pickles on a potato pepper bun. 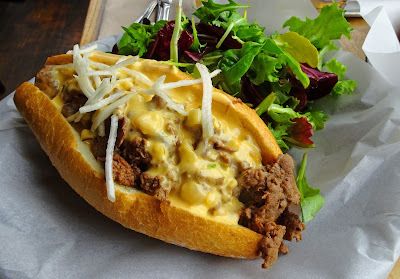 Ms. Goofy had the Philly Cheesesteak which consisted of thinly sliced tender sirloin, onion confit, grilled and marinated mushrooms, matchstick cut turnips, mayo and warm beer cheese fondue on a hero roll. They both were fantastic. Clove and Hoof is our destination stop for a top notch meal. What a great start to a New Year. Let's start this year off with a rousing Happy New Year cheer. Happy New Year. I wanted to share a wonderful present that was under this year’s Christmas tree. It was an Original Kettle Premium Limited Edition Weber. In the past I have jested that some Christmas there would be a Big Green Egg under the tree. It did not happen this year but this may be even better. In reality I am deep down a Weber man for life and this bbq is my latest proud addition. It is so shiny red. 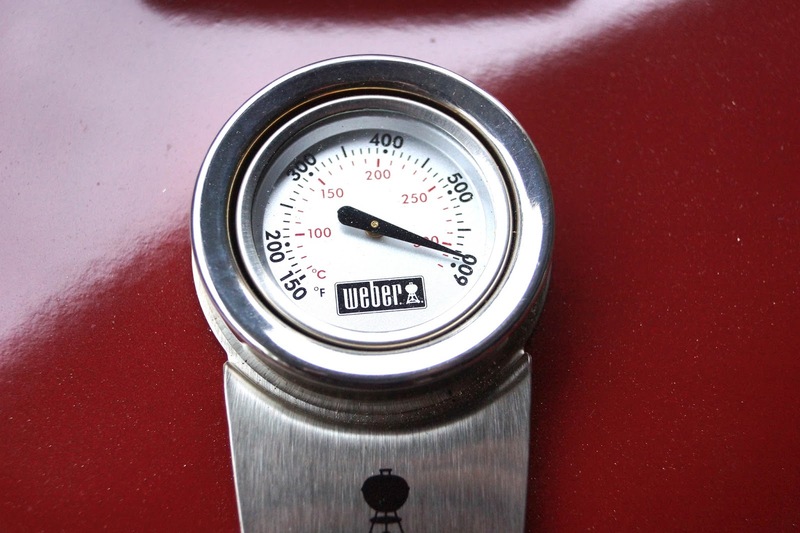 Weber calls this bbq a collector’s kettle. It does have many premium bells and whistles. There is a built in lid thermometer, plated steel hinged cooking grate, tuck away lid holder, lid handles with heat shields, removable high-capacity aluminum ash catcher, aluminized steel one-touch cleaning system, spring clip/push pin leg assembly, limited edition lid badge and a very bright red color. Most of these feature are not new and are available on other models. What this bbq does is combine all these features to create this premium Weber. It was Christmas morning and I was giddy like a kid with a new train set. This unit had to be assembled. (You can buy them assembles at some box hardware chains). The assembly was simple if you read the instructions. Of course I did not and put a handle upside down and re-arranged the kettle legs so it would not roll properly. This was a simple fix and I have assembled my new pride and joy. All is left is a test run cook. 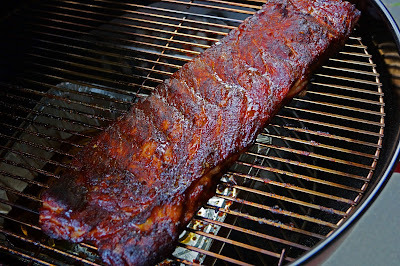 Like all new barbeques, I like to build a fire to season and burn out any factory nasty's.This was done and a rack of St. Lois cut ribs was the first test. I cooked them using an indirect heat for 3 1/2 hours. They turned out fantastic. 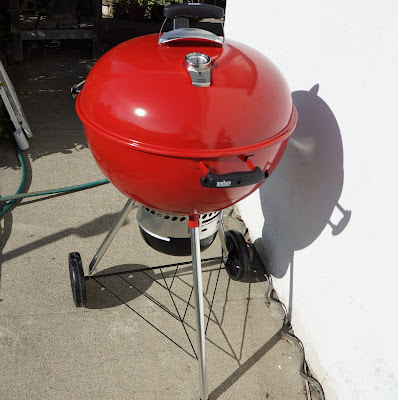 This new Weber performed like a champion. It was a little frustrating to dirty my pristine red Weber but this is part of the cooking process. I love my new Original Kettle Premium Limited Edition Weber. 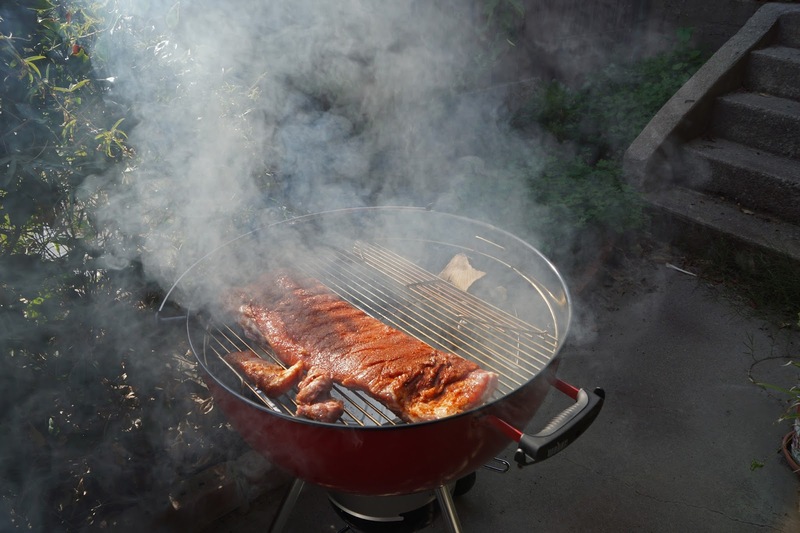 It has all the latest bells and whistles associated with Weber kettles. Is it perfect?. To me it almost is. I wish Weber would offer this as a standard model and not market it as ‘Premium’. Like most huge corporations, Weber has been criticized lately for declining quality with rising prices. This new kettle is premium and I personally hope this is an indicator of future Weber products to come.